Disgusting Kaepernick Donated $25K to Group Associated With FBI’s Most Wanted Terror LIST! As the controversy surrounding former San Francisco Forty-niners third-string quarterback Colin Kaepernick continues in the face of Kaepernick being named the spokesman for Nike’s 30th year anniversary for the “Just Do It” campaign, the anger of the American people continues to swell. It was revealed that Kaepernick made a $25,000 donation to a charitable group honoring convicted cop killer named after former Black Liberation Army member Assata Shakur, Chicago-based Assata’s Daughters in 2017 as part of a $1 million charitable pledge. “Colin Kaepernick’s $25,000 donation to a charitable group honoring a convicted cop killer has been revealed. Kaepernick’s foundation made the donation to Chicago-based Assata’s Daughters, named after former Black Liberation Army member Assata Shakur, in April as part of a $1million charitable pledge. 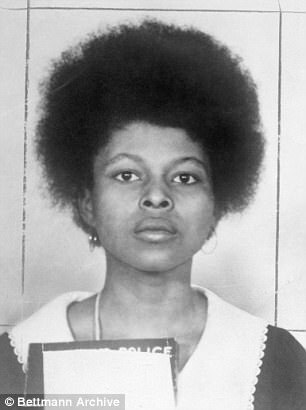 Assata Shakur (top) was convicted of first-degree murder in the 1973 shooting death of New Jersey state trooper Werner Foerster (bottom). Kaepernick has donated to a charity named for her. 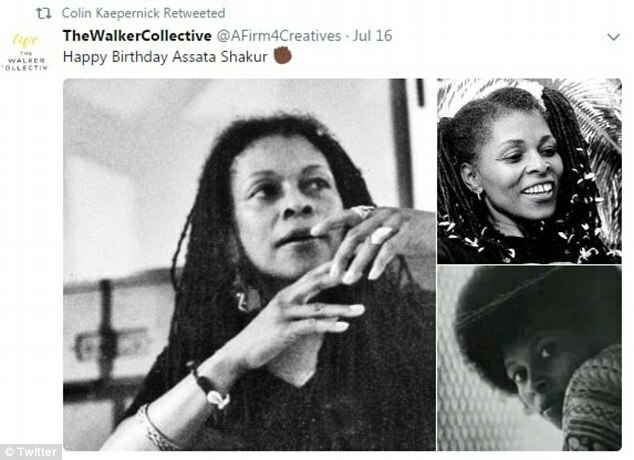 Kaepernick retweeted this birthday greeting to Shakur in July . She is wanted by the FBI. ‘We prioritize this work to help the current momentum of the Black Lives Matter movement to carry on into the future,’ the statement continues. Kaepernick’s foundation specified that $2,500 of the donation would go to Cop Watch, a program that trains volunteers to follow and video police officers. Another $15,000 is earmarked for ‘teen workshops’. 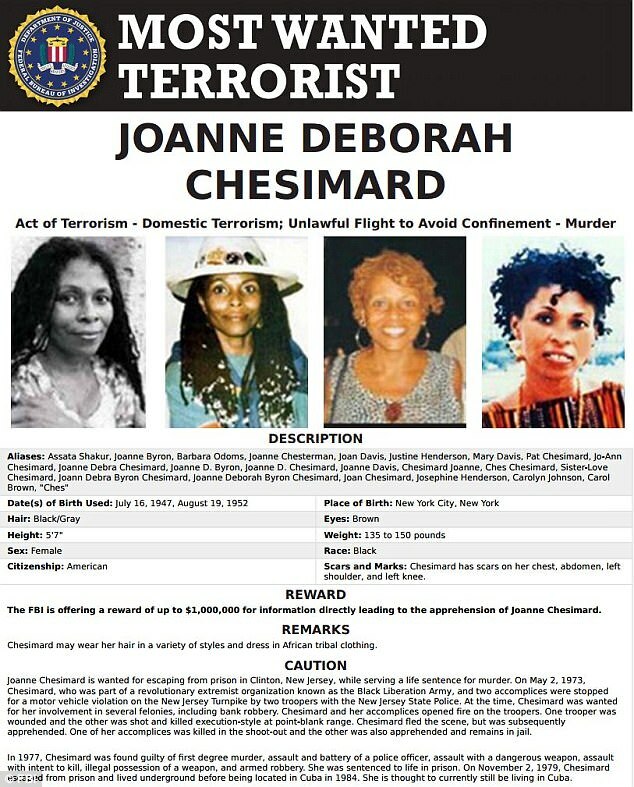 Shakur, whose legal name is JoAnne Deborah Chesimard, has become a revered figure in some activist circles, despite currently lodging on the FBI’s Most Wanted list. A former Black Panther who joined a more militant offshoot of the group, Shakur was already wanted on several charges when Trooper Foerster pulled over a car she was in for a broken taillight. 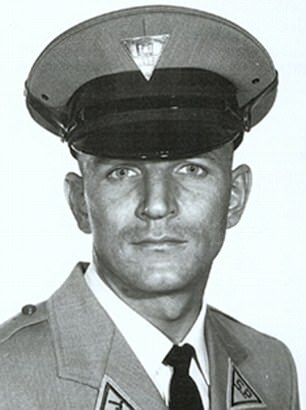 In a shootout, Foerster was killed and Shakur was wounded. Accounts differ as to whether she or another occupant of the car pulled the trigger, but she was successfully convicted of murder under aiding and abetting laws. Shakur was sentenced to life in prison, but escaped in 1979 when members of the Black Liberation Army visited her behind bars with concealed handguns, took prison officials hostage and commandeered a van. Though the two are not related, Shakur was godmother to rapper Tupac Shakur, whose stepfather was convicted of aiding her escape from prison. Word of Kaepernick’s donation, which was first reported by the Washington Times, comes as the protest against police that he launched last year creates a national furor. President Donald Trump last week blasted National Football League players who, imitating Kaepernick’s protest, kneel during the national anthem. Players across the league responded in defiance, amplifying the protest and polarizing their fan base, many of whom saw the gesture as an insult to national symbols. Kaepernick included this contribution as part of a pledge he made last year to donate $1 million over a period of 10 months to “organizations working in oppressed communities.” To date, he has donated $900,000 in grants to 31 different organizations, many of which are social justice groups or advocacy groups pushing left of center agendas on issues like abortion, climate change, criminal-justice reform, and immigration. According to the Washington Times contributions include – “$25,000 for 350.org, a climate-change group dedicated to fighting fossil fuels, and $25,000 for the Center for Reproductive Rights, a pro-choice advocacy organization. The foundation gave $50,000 in December for a “health clinic partnership” at the now-defunct Dakota Access pipeline protest, and $25,000 to United We Dream in order to “keep DACA in force,” referring to President Obama’s Deferred Action for Childhood Arrivals executive order. The former San Francisco 49ers quarterback also has close ties to the Women’s March, including organizers Tamika D. Mallory, Carmen Perez and Linda Sarsour. The Kaepernick Foundation donated in June $25,000 to the Gathering for Justice NYC, headed by Ms. Perez, while Ms. Mallory and Ms. Sarsour appeared at the Aug. 24 pro-Kaepernick rally outside NFL headquarters. Part of the Kaepernick Foundation’s $33,000 donation for the Lower East Side Girls Club was designated for travel and lodging for the Women’s March convention in October. The Women’s March has its own Shakur connection: The group came under fire in July for a tweet celebrating the birthday of Shakur. Shakur was placed on the FBI’s most-wanted list as a “domestic terrorist” who belonged to an “extremist group,” the Black Revolutionary Army.